Hioki 3153 Programmerbar automatisk isolations- og gennemslagstester. This electrical safety test instrument series is designed for insulation resistance and voltage withstand testing of electrical devices and components according to various safety standards. A multitude of automation and labor-saving features are provided to ensure effective testing for a wide variety of requirements and test conditions. Select the most appropriate model for your applications. 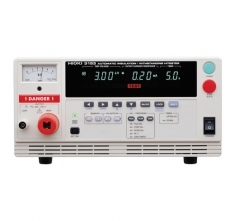 Power supply 100 V to 120 V AC / 200 to240 V AC, (50/60 Hz), 1000 VA max.